RIO de JANEIRO — Imperfect for sure, like life itself, the Rio 2016 Summer Games sighed Sunday to a close, an Olympics likely to go down in history for first-rate sport that offered a break from a welter of financial, logistical and political challenges or perhaps served merely to underscore just how difficult it is, now, to put on an Olympic Games. For every Michael Phelps, there was the story of green water in the diving pool. For every Usain Bolt, there was the stray bullet that pierced the tent at the equestrian center. For every Simone Biles, there were the winds that ripped an overhead television camera from its cable at Olympic Park, injuring seven people, two of them children. To draw an analogy from golf, which made its Olympic debut here with many of the world’s top male professionals opting out: these Games were a grind, hazards everywhere, the kind of round where any reasonable player would, upon sinking that last putt on 18 to complete a round pocked with bogeys, pause to look around and go — whew. “An iconic Games but it is also a Games in the middle of reality,” he said, adding, “It has not been organized in a bubble but in a city where there are social problems and social divides, where real life continued. In 2009, when the IOC awarded these Games to Rio, over Chicago, Madrid and Tokyo, Brazil’s economy was booming. Party! Like the percussive dance jam that pumped through Sunday night’s closing ceremony at the famed Maracanã Stadium, accented by the return of the shirtless, oiled-up, buff opening ceremony flag bearer from Tonga, the taekwondo athlete Pita Taufatofua. Problem is, between 2009 and Sunday night, the Brazilian economy crashed. This made plain the No. 1 issue that bedeviled these 2016 Games. It was not lack of planning or late planning or attention to detail, though those were concerns. Instead, when issues stemming from planning or detail would arise, there simply was not sufficient money to make it 100 percent right. This reality, when the Paralympics open in just a couple weeks amid deep budget cuts, will be even more manifest. Meanwhile, Brazil has been buffeted by political corruption and turmoil. The country is, even now, in the midst of a presidential impeachment drama. Then, in the weeks before the Games, the headlines elsewhere frequently trumpeted fears of Zika, of scary water, of the street crime and way, way more, including outrage — from all sides — over reports of state-sanctioned doping in Russia. It is worth noting that, before Brazil, the only nation to have put on both the soccer World Cup and the Olympics in a two-year span is the United States, soccer in 1994 and the 1996 Summer Games in Atlanta. Those 1996 Games are not remembered fondly — with transit, technology and security woes. The 2014 World Cup happened. And the many predictions of colossal disaster for Rio 2016: averted. Zika: swarms of mosquitoes did not appear. Water: rowers, sailors, swimmers did their thing. Security: a lot of armed soldiers but, to be honest, that is now reality everywhere post-9/11. Indeed, as soon as the sport itself got underway, the spotlight shifted to the athletes of the world, and their struggles and accomplishments. To quote the American Sam Kendricks, bronze medalist in the men’s pole vault: "The Olympics is like high tide, it raises all boats and brings the best out of all of us." The Russian ban meant its usually-strong track and field team — with the exception of one long jumper, Darya Klishina — didn’t travel. She finished ninth in the women’s long jump. That helped open the door for the United States, in particular, to record its best medal count since the boycott-marked 1984 Los Angeles Games — 121 overall, 46 gold. Second depends how you count, by gold or overall. The American way prioritizes the overall count. China had 70, 26 gold. The rest of the world goes by the gold standard. Great Britain finished with 27 gold, 67 overall. The Russian team finished with 56 and 19. In 1984, the Americans won 174 total. In London four years ago, 103. The U.S. swim team won 33 of the 121 medals. The track team, 32, Galen Rupp running Sunday morning to bronze in the men’s marathon. Some stalwarts produced as expected. Katie Ledecky won four gold medals (and a silver), setting two world records. Phelps, five gold medals (and a silver). He now has 28 career Olympic medals, 23 gold. Biles, the world’s best gymnast: four gold medals (and a bronze). She carried the U.S. flag into the closing ceremony. Usain Bolt completed the triple-triple, winning the 100m, 200m and taking part in the victorious 4x100m relay for a third straight Games — after London in 2012 and Beijing in 2008. The U.S. women’s basketball team cruised to a sixth straight gold. On Sunday, in one of the final contests of the Games, the U.S. men’s basketball team completed a three-peat under coach Mike Krzyzewski, defeating Serbia, 96-66, for gold. The NBA star and USA Basketball stalwart Carmelo Anthony won his third gold medal— the only male basketball player in Olympic history with three golds. “This is still a magic city and a magic place,” Nuzman insisted Sunday night. Some performances, even if unexpected, proved thrilling — the magic, perhaps, of the Olympic experience. Brazil gained a measure of revenge for the 7-1 2014 German World Cup semifinal beatdown by defeating Germany to win gold in men’s soccer, 5-4 on penalties after tying 1-1 in regulation. South Africa’s Wayde van Niekerk not only won gold in the men’s 400m, he set a new world record, 43.03 seconds — obliterating Michael Johnson’s 1999 mark, 43.18. Britain’s Mo Farah completed the distance double-double, winning the men’s 5000m and 10000m runs, just as he had in London. Matthew Centrowitz of the United States won the men’s 1500m at the track, the first gold for the United States in that event since 1908 — a signal of karma, perhaps, for Chicago Cubs fans everywhere. The American swimmer Anthony Ervin, 35 years old, won the men’s 50m free a full 16 years after he had done the very same thing in Sydney. The U.S. track standout Allyson Felix won three medals, two gold in the relays, and now has six golds overall — most of any female track athlete in Olympic history. If the essence of that Olympic experience, meantime, is the gathering of the world’s young people, there was more, way more, in the unexpected category. The Fiji men’s rugby sevens team won that island nation’s first-ever Olympic medal. It was gold. Kosovo judoka Majlinda Kelmendi won that eastern Europe nation’s first-ever Olympic medal. It was gold. Singapore swimmer Joe Schooling won that small Southeast Asian nation’s first-ever Olympic gold. He won the men’s 100m butterfly, with Phelps, South Africa’s Chad le Clos and Hungary’s Laszlo Cseh forging a three-way tie for silver. The 10 members of the refugee Olympic team didn’t win any medals - not hardly. “I hope,” swimmer Yusra Mardini, who escaped the war in Syria, said after the heats of the women’s 100m freestyle, “refugees are not refugees any more and they have their hope to continue their dreams after they see us." At the beach volleyball venue, in an early-round women’s match, Egypt played Germany, Egyptian Doaa Elghobashy fully clothed and her head covered in a hijab, the German duo in bikinis. Before the Brazil-Argentina men’s basketball game last weekend, a thrilling affair that went to double overtime, Argentina prevailing, 111-107, Brazil’s Marcelo Huertas and Argentina’s Luis Scola addressed the crowd to make a plea for the key Olympic values: friendship, excellence and, most of all, respect. “We’re Latin American brothers,” Huertas said, “and we are counting on you to have a celebration." Scola said, “On behalf of my team, I want to ask you to cheer for your team, to have fun in a civilized manner and with a lot of respect." This, in the end, is the enduring lesson of the Olympics — one the American swimmer Ryan Lochte is sure to have considerable time to mull over in the aftermath of his purported robbery story, a tale that hijacked considerable focus the second week of the Games away from the hopes and dreams of the many athletes still here. Meanwhile, Ireland’s Patrick Hickey, a member of the IOC’s policy-making executive board, was arrested on suspicion of involvement in a ticket scam. If Monday is travel day for most who were here, the 71-year-old Hickey’s immediate future remains entirely unclear. He reportedly was locked up in the maximum security Bangu Prison here while the wheels of Brazilian justice start to spin. Because of the way the Olympic cycle works, it’s now roughly 17 months until the next edition of a Games — the 2018 Winter Olympics, in the hamlet of Pyeongchang, South Korea. This past Tuesday, Taylor Fletcher won his first U.S. national title in Nordic combined; in warm weather, they substitute roller skis for the waxed winter kind. In between Rio and Pyeongchang, at an assembly in September, 2017, in Lima, Peru, the IOC will make its 2024 pick. Los Angeles, Paris, Rome and Budapest are in the hunt. Tokyo will put on the 2020 Games. The IOC here affirmed the introduction of new sports at those 2020 Olympics, among them surfing, skateboarding and rock climbing. Late Sunday, as Rio came to a close, the Olympic Channel went online — the Olympic movement’s digital effort to make the Games more relevant than a thing every two weeks every two years, to highlight the stories of the athletes who, despite everything, can and do provide inspiration to the little kids they used to be and, as well, the grown-ups trying to make sense of our imperfect world. As Bach said in opening these Rio Olympics, “We are living in a world of crises, mistrust and uncertainty. Here is our Olympic answer." Further crises and uncertainties assuredly await. The next editions of the Olympics, too, “iconic” or not. EUGENE — The women’s 100 hurdles here Friday at the 2016 U.S. Olympic Track Trials proved one of those rare sports events that truly lived up to expectations. It was the race of the meet: Brianna Rollins winning in 12.34 seconds, the second-fastest Trials final ever. The second- through seventh-place finishers made for the fastest finishes for place in Trials history. 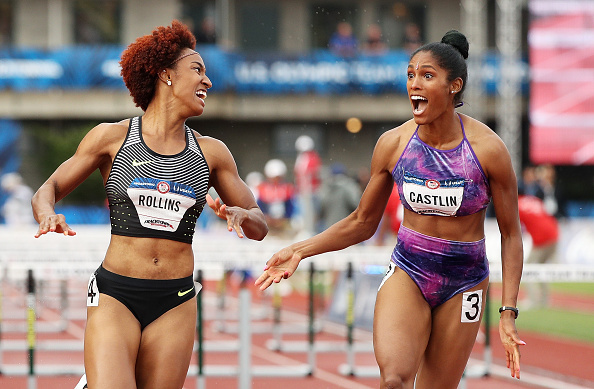 Kristi Castlin took second, in 12.5, Nia Ali — just 14 months after giving birth to a son, Titus — 12.55. Many will say that sports are, or ought to be, separate from politics. Indeed, it’s tempting here in snug little college-town Eugene -- and, more, within the track and field bubble that is historic Hayward Field, with a stadium-record 22,847 jammed in on Saturday -- to deem events in Louisiana, Minnesota and Texas far away. As the International Olympic Committee president Thomas Bach put it in a speech in South Korea in 2014, “In the past, some have said that sport has nothing to do with politics, or they have said that sport has nothing to do with money or business. And this is just an attitude which is wrong and which we can not afford anymore. To that end, sports stars can have a powerful impact in advancing precisely the sort of dialogue we — all of us — need as we head further into the heat of a summer that, with two potentially volatile political conventions coming up, increasingly seems to evoke the discord and discontent of 1968. Across the United States, Saturday saw protests tied to police shootings of black men: in Baton Rouge, San Francisco, Chicago, West Palm Beach, Fort Lauderdale, Pittsburgh, Philadelphia and Newport, Rhode Island. The flag at the southern end of Hayward Field has been flying this second half of these Trials at half-mast — in unspoken testimony to our country’s unhealed wounds connected to race and policing. If anyone needs a living reminder of how far we have come and how far we have yet to go — John Carlos, whose black-gloved left fist along with Tommie Smith’s right made history at the Mexico City Olympics in 1968, has been here in Eugene this week, a powerful reminder of how we can all do better. If Friday's women's 100 hurdles was spectacular, so too was the bang-bang-bang sequence that closed Saturday's run: the men's 5000, won by 41-year-old Bernard Lagat; the men's 200, won by Justin Gatlin, who earlier in the meet had taken the 100, with 400 winner LaShawn Merritt running second; and the men's 110 hurdles, won by University of Oregon star Devon Allen. Punctuating that brilliance: an appeal from Gatlin, over the Hayward loudspeakers that we all do better by each other. "There is a lot that has been going on in America the last couple days," he said a few moments later, in the press tent. "It's sad that it happens around the 4th of July, when we should all be proud to be Americans. "We need that as Americans. When we are overseas, sometimes you don't see an American flag. Maybe sometimes you see one American flag. Those people holding up American flags are so proud to be Americans. And I want everybody to understand that when we go down to Rio, we are representing the United States of America. We want to represent with pride. It's just so sad to see everything that is happening right now. I just want everybody to be happy." Gun violence has been a scourge on the American landscape for far too long. In Kristi Castlin's case, the issue is deeply personal. Her father, Rodney Castlin, was shot to death on December 7, 2000. He was the night manager of a motel in Kennesaw, Georgia, killed in a robbery that produced $304. He was just 36. Just weeks ago, James Lorenzo Randolph, now 34, was convicted of multiple felonies in connection with the shooting, including murder, and sentenced to three consecutive life terms plus 35 years. He was connected to the case in 2012 by a fingerprint finally run through the FBI's national database. Kristi Castlin turned 28 on Thursday. She was just 12 when her father was murdered. "I definitely know first-hand now it feels, not just to be a child but to lose someone you love to gun violence," she said in an interview, adding, "Things that money buys, all the material things -- when you lose someone that you love, it’s really hard. It’s just sad whether black, white or indifferent, people treating lives like they are disposable." More stories about the real-life impact of gun violence. More real people -- and that includes athletes -- to speak up about what's so obviously right. Serena Williams, the tennis star, won the Wimbledon women’s singles title on Saturday, a record-tying 22nd Grand Slam; later Saturday, Serena and sister Venus Williams won the Wimbledon women’s doubles championship, a 14th Grand Slam doubles title together. To be clear: it’s not that every athlete, whether on the Olympic team or not, has a responsibility to speak up. No one is saying that is an imperative. But it’s also the case that the U.S. track team, along with the U.S. basketball teams, makes for the picture of the diverse and multicultural America that we genuinely are in these early years of the 21st century. "We have a voice," Gatlin also said. "We should be able to use that voice with love and caring." And unlike the basketball teams — in particular, the NBA stars — track and field athletes are way more often built like most of us, meaning the intimidation factor for the average fan is way lower. Also, the track stars tend to be remarkably accessible. Before Saturday’s action at Hayward, the distance standout Mary Cain was walking down Agate Street, stopping — just like everyone else — at the long light at Franklin Boulevard. A few minutes later, Matthew Centrowitz — it would be shocking if he isn’t top-three in Sunday’s men’s 1500 final — went jogging by on Franklin, out for an off-day slow run. DeeDee Trotter, the three-time Olympian at 400 meters, bronze medalist in 2012 and two-time gold winner in the relays (2004, 2012), saw her 2016 bid get as far as the semifinals. Jason Richardson, London 2012 silver medalist in the 110-meter hurdles, gold medalist in the event at the 2011 world championships, took to Twitter earlier this week to tell a story about how, when he was 17, he was stopped by police and given a traffic ticket. Like Trotter, Sanya Richards-Ross, the London 2012 400 gold medalist (five medals in all over three Games, four gold), saw her competitive career come here to an end. Battling injury, she started but could not finish the first round in the 400. The flag fluttered softly in the breeze Saturday at Hayward. Before the Olympic Games in Rio comes the Republican convention, the week of July 18 in Cleveland, and the Democratic convention, the week of July 25 in Philadelphia. We all — athletes and the rest of us — have the chance to speak up. “Martin Luther King dedicated his life to love, and to justice between fellow human beings. He died in the cause of that effort. In this difficult day, this difficult time for the United States, it’s perhaps well to ask what kind of a nation we are, and what direction we want to move in. “For those of you who are black — considering the evidence evidently is that there were white people who were responsible — you can be filled with bitterness, and with hatred, and a desire for revenge. “We can move in that direction as a country and greater polarization, black people amongst blacks, and white amongst whites, filled with hatred toward one another. “Or we can make an effort, as Martin Luther King did, to understand, and to comprehend, and replace that violence, that stain of bloodshed that has spread across our land, with an effort to understand, [with] compassion and love. He died in the cause of that effort. “What we need in the United States is not division; what we need in the United States is not hatred; what we need in the United States is not violence and lawlessness, but is love, and wisdom, and compassion toward one another, and a feeling of justice toward those who still suffer within our country, whether they be white or whether they be black. “So I shall ask you tonight to return home, to say a prayer for the family of Martin Luther King, that’s true, but more importantly, to say a prayer for our own country, which all of us love — a prayer for understanding and that compassion of which I spoke. “We can do well in this country. We will have difficult times. We’ve had difficult times in the past but we — and we will have difficult times in the future. It is not the end of violence; it is not the end of lawlessness; and it’s not the end of disorder; it’s perhaps well to ask what kind of nation we are. “But the vast majority of white people and the vast majority of black people in this country want to live together, want to improve the quality of our life and want justice for all human beings that abide in our land. “Dedicate ourselves to what the Greeks wrote so many years ago: to tame the savageness of man and make gentle the life of this world," a reference indeed to the Olympic ideal.